Actually, it takes more than a day. I had to find the spices, hunt for a decent andouille sausage, and buy and shuck the crawfish. All of these are extremely time consuming. When choosing a gumbo recipe there are many available. It seems they can be divided into two categories: with okra and without okra. Okra is a seasonal vegetable, so it’s good to have a back-up plan. Okra is a super-starchy, very sticky vegetable (gooey, actually). It also has a woodsy flavor. Louisianians go for filé powder as a substitute when okra is out of season. Filé is dried, ground sassafras leaves. While it’s not sticky, it is woodsy in taste, and it has thickening power. My gumbo preference has strongly been to cook with okra — it just doesn’t seem like gumbo without the stuff. What I did this time was inspired by an idea I saw to use filé powder as a table seasoning. 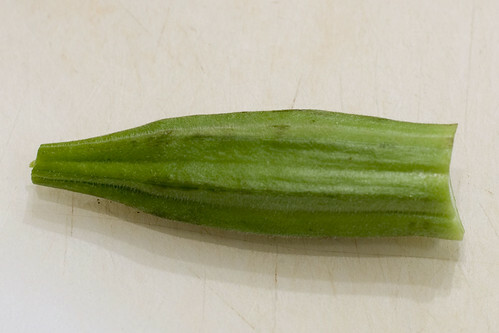 Tip #2: Decide whether you want an okra-included gumbo recipe. Gumbo is a soup, or at least a stew. It is meant to be wet, so you’re going to need plenty of liquid. My recipe (included below) uses 6 cups of liquid, and probably could’ve taken more, if I was going to cook it longer. Many recipes like to use water, or at least suggest substituting water if stock is not available. If you’re going to go through the hassle and devote the time to make gumbo, then heed my Tip #3: Make and use crawfish stock as at least half the liquid. Crawfish are truly difficult to deal with. First, in NYC, the mecca of ingredients, I could only find pre-cooked, pre-seasoned, frozen crawfish. In the past, I have found raw, frozen crawfish. Supposedly due to bad weather, the 2009 season is not very good, which may be why only one store (in Chinatown) out of the six that I checked had any crawfish. Sad. Second, 10 pounds of crawfish yielded about 1.4 pounds of tail meat and it took almost two hours to shuck them. Third, the price didn’t seem bad at $2.30 per pound, but a fair amount of that went towards the fact that they were cleaned, seasoned, and pre-cooked. And if you consider the yield, the net price of the tail meat was $16.43 per pound — pricey! For that price, I can get some awesome prawn or lobster. So this is definitely a treat. Tip #4: Unless you’re near a local source, crawfish are expensive and hard to find; either way they’re difficult to deal with; so, don’t screw up and don’t plan on doing this often. By the way, I’m going to comment on using pre-cooked seafood. Jessica and I HATE using pre-cooked seafood. Most seafood cooks very quickly, so cooking it twice is a sure fire way to ruin it. Crawfish is one of the very few exceptions–here’s why: you must cook the crawfish prior to shelling them anyway. So the only downside to buying them pre-cooked, is that you’ll have to use once-cooked shells to make your stock and your stock is likely to not be as strong. I am sad that I could only get pre-seasoned crawfish; but it was red pepper, so not so bad. Speaking of being difficult to deal with… peeling crawfish is a pain! Most resources online advise twisting the tail to separate it from the body. And there are various techniques for removing the tail meat from the shell. However, none of them work as well as the technique I’ve devised. After working through 10 pounds of the mud bugs, I assure you this is the best way. Tip #5: To shell crawfish, first: hold the body with one hand and the tail with your other. Drive your thumb (of the hand holding the body) into the back of the body shell (just before the tail starts) to crack it a bit, then twist the tail and pull back gently to separate the tail. The goal is to keep as much of the body meat attached to the tail as possible. Second: hold the tail in all your fingers and press it simultaneously along sides until you hear it crack. The goal is to crack it lengthwise (from where the body was to the tail fan). Then holding each side of the tail with each hand pull back to rip the sides apart. While not perfect, this seemed to be the most effective method. Okra are annoying as well (is nothing easy in gumbo?). They can be prickly on the outside and they’re very starchy, gooey, and sticky inside. Once sliced, they stick to everything. If not handled correctly they can make your gumbo worse, rather than better (the obvious goal). 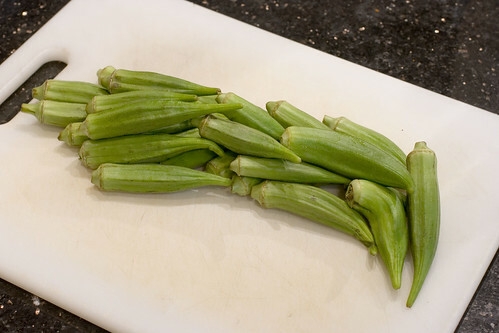 Here’s a good guide on how to clean okra correctly (as shown in the image above). 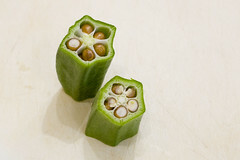 Tip #6: Cut off the tip and top of the okra. Cut the top in a curved shape (similar to removing the top of a strawberry). There is a stem-like part that runs down the center, you want to remove the parts that are only the stem, they taste bad. I’ll mention this, not as a tip, because I’m not confident, but I think that when the okra get too ripe and get bigger, the seeds inside turn brown (as in the image to the right). You can still eat these, but I think they’re too rough. So the one or two like this, I just chucked. The second half of cleaning okra is washing them. Most resources online recommend rubbing the okra against each other to clean them. I’ve got a great technique here in Tip #7: After trimming the okra, put them into a mesh strainer (don’t over-crowd it), and under running cold water, shake the okra violently. Not only will the okra rub against each other, but the mesh will act like sand paper and remove any rough spots. Do this for about two minutes. Then dry in a sandwich of paper towels. Now here’s another tip about the okra. When you cook okra, the starches seem to activate and will become stringy. I’ve seen some dishes where it looks like a cob web of okra starch. Personally, I find this gross and it will make your gumbo nasty. Tip #8: To avoid stringy, starchy okra, pre-cook the sliced okra in a frying pan with about one tablespoon of white vinegar per 1/3 pound of okra over medium-low heat. Keep the okra moving and cook until the okra just starts to stick to the pan and the vinegar is gone. Gumbo is not gumbo without a roux. Roux is the base for many sauces in French cooking, so I expect most chefs have made one before. It’s just fat + flour, cooked together. Real Mac & Cheese has roux. Roux is qualified based on how long it’s cooked, and therefore how dark the color of the roux is. Really, all you’re doing is frying the flour. Overtime it will turn from blond (very light) to peanut butter-colored (medium) to chocolate colored (dark) to coffee colored (very dark). Different gumbos usually call for anywhere from medium to very dark (never light or very light). The darker the roux the stronger the taste and more powerful the thickening action. I feel strongly that very dark is critical for roux. Tip #9: To get a perfect very dark roux for your gumbo cook the roux by itself until it is dark (chocolate colored), then add your trinity. It will continue cooking for a bit becoming very dark. If you cook it very dark before adding trinity, it will over cook. Cooking roux is time consuming and can not be rushed. There is a joke in gumbo cooking, where the first step is to marinate the chef. Trust me, if you sip a beer while stirring your roux, you’ll be plastered by the time it’s done. My roux took about 30-40 minutes. And you can not walk away from it for more than about 20 seconds or it will burn. 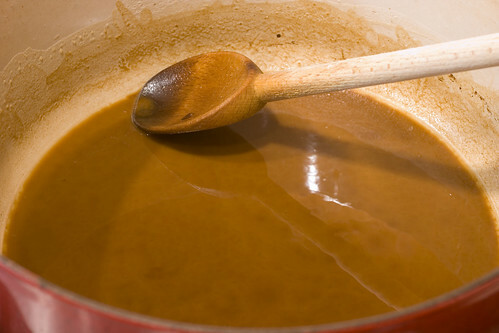 Tip #10: The best roux is achieved by having a very consistent color throughout. Keep in mind that the hotspots on your pot will cook the roux much faster; and keep in mind that the flour will constantly fall out of suspension and sink to the bottom of the pot. You must stir thoroughly, scraping the bottom of the pot, at least every 20 seconds. And don’t stir too violently, or you’ll splash yourself with scalding oil. Here’s the thing about roux, it stays well in the freezer (as kind of a sludge). So you can stop it earlier in the cooking process (take into account carry-over cooking), once it cools down, store it in plastic ware and it will solidify. Then you can melt it back down and use it. But, while it’s hot, you’re best not letting it continue cooking. The next step is to saute your veggies, but you won’t have time to cut them while stirring the roux. Tip #11: Mise-en-place!!! Do all your cutting and prep work prior to starting your roux. 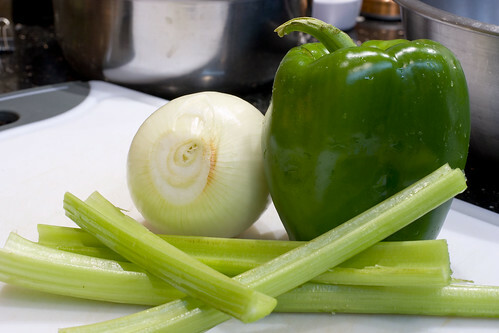 Cajun cooking relies on the Holy Trinity: celery, green bell pepper, and onion. Many cuisines have base aromatics. In French cuisine it’s the mirepoix (celery, carrots, and onion); in Latin cuisine it’s sofrito (varies a bit, but typically garlic, red bell pepper, and onion). Tip #12: If you hunt for gumbo recipes, make sure it includes the trinity, otherwise something is weird. If you’ve ever watched Chef Emeril Lagasse cook, you know he’s got a spice blend. Well, most cajun chefs have one. It’s because their recipes almost all call for creole or cajun seasoning. While they vary a bit, there are some common ingredients. 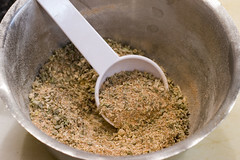 Tip #13: Mix up a cajun spice blend and use it in your recipe. Exclude salt so that you can control salt levels. Include Onion Powder, Garlic Powder, Paprika, Oregano, Basil, Cayenne Powder, White Pepper, and Black Pepper. Oh, by the way, gumbo should be salty. Towards the end of the cooking process, taste for seasoning. Make sure it’s got plenty of salt. People include all sorts of proteins in their gumbo (except for one classic version that is vegetarian). Most non-veg. versions include sausage and the classic type is andouille. 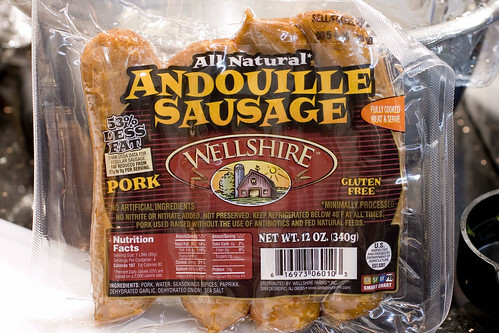 Andouille is a smoked, pork sausage with a truly distinctive taste. I can’t imagine gumbo without it. That is why I tried to find a decent one. The one I found, at Whole Foods, was mediocre, but it did meet one requirement I had: no nitrites or nitrates! Those chemicals ruin the taste for me. Tip #14: Include andouille sausage and try to find a good one. It’s smoked (pre-cooked) so, if you can, taste before you buy. Finally, this is not so-much a tip, but more a note about the specifics of what I did. Since my recipe calls for beer, I decided to use a New Orleans beer. 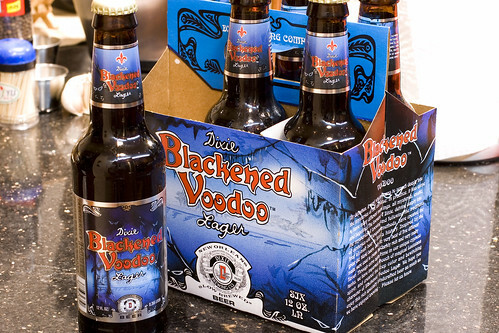 And I found one at Whole Foods called Blackened Voodoo from Dixie Brewing. According to the container (and the web site), “Dixie Brewery is the last remaining survivor of New Orleans’ once flourishing Brewing Industry.” While it get’s a B- on Beer Advocate, it has a decent taste, it’s native, and it is pretty dark (at least for a lager). So I feel like it was a good pick for my gumbo. Ok, ok, I’ll shut up now and make with the gumbo… ooo wee! 1 lb. 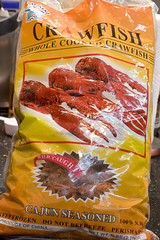 4.5oz Crawfish Tail Meat (4.5 cups); Or about 9 lbs full Crawfish. In a heavy-bottom dutch oven, over low heat, combine oil and flour. Stir continuously for about 30-40 minutes (crazy, huh?) until a milk-chocolate color is achieved. Add celery, bell pepper, onion, garlic, and a good pinch of salt to cover. Continue stirring to coat vegetables evenly. Cook until roux becomes dark (like coffee) and vegetables are soft. While trinity is softening, saute okra in vinegar in a pan over medium-low heat. Stir continuously and cook until okra starts to stick and vinegar is gone. Add to roux mixture. Add the stock, beer, bay leaves, seasoning, thyme and sage. Raise heat to medium low, stir to combine, and let cook for 30 minutes. Add tomatoes, sausage, and hot sauce. Stir again and continue cooking another 30 minutes. Turn off heat, stir in crawfish tail meat, let stand 5 minutes, then serve hot! To make the dressing: combine equal parts scallion and parsley, season with seasoning and file powder, combine with lemon juice. Serve over steamed white rice or dirty rice, and dress with the scallion/parsley mixture. I served the extra family style. posted by Lon	at 10:54 AM	Filed under American, Recipes. You can follow any responses to this entry through the RSS 2.0 feed. Both comments and pings are currently closed. Too bad I don’t have the time to make this. It looks fabulous! Aww I was looking forward to the crawfish patty! -=( lols but this looks soo delicious! 1. Looks amazing and classic. 2. I can’t believe you didn’t go with the etouffee. The I feel like your readers elected George Bush. 3. For all shellfish I use kitchen shears. So fast on shells and no scratches on my fingers. 4. Alton Brown has what looks like a great no-stir recipe for rue. 5. I think rue is way over-rated as a flavor. Whenever I’ve tried to make it, it is too powerful for any stew. Makes it hard to enjoy the taste of the more important ingredients. ahem, roux, not rue… I was going to make a joke about the fact that based on the time, you might “rue” the day you made Gumbo. I guess it stuck with me. ooops. oh WOW. 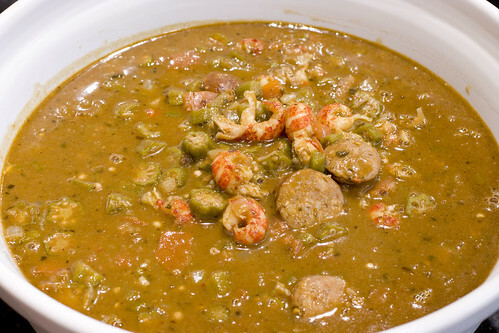 what distinguishes gumbo from other types of soups/stews? You can’t beat a good gumbo! Wonders – I personally was hoping for the stuffed clam. Oh well..
Here’s the thing about no-stir roux (a.k.a. oven roux): commercial kitchens toast the flour on its own to bring out the nutty flavor and jump-start the roux process. It requires much less attention (just move the flour every 20 minutes, as opposed to every 20 seconds). However, it requires much longer. A dark toast will take a couple of hours. Further, once the flour is done, you then need to cook it in fat in the pan to bring it together, that takes at least another 5-10 minutes (with stirring). So, the process make a lot of sense if you’re making huge quantities, but there’s not a lot of benefit for one pot recipes. In regard to flavor, I don’t totally disagree with you. Roux is really not an exceptional flavor. 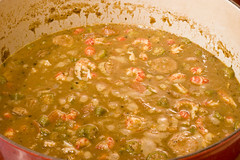 However, it is unique and definitely makes certain dishes, like gumbo or bechamel. Stews are supposed to have powerful flavors, I think any stew should easily hold up the flavor of a roux. Bill & EMC – I can't imagine trying to work over crawfish with sheers. First of all you would lose some of the meat in the body without the twisting. 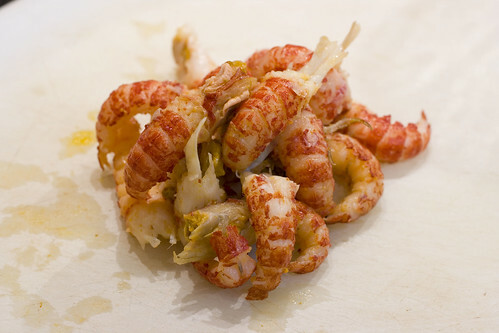 Secondly, they're so small, smaller than shrimp, so it would require such precision, it would take even longer! If you do try it and figure out a good technique let us know! 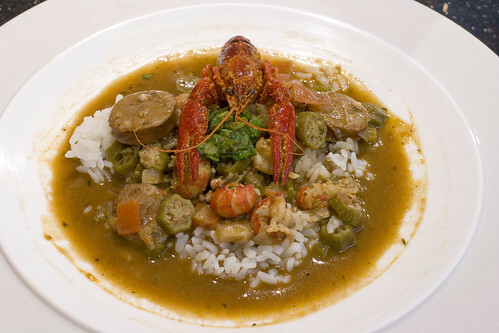 Pearl – Broadly speaking, the ingredients distinguish gumbo from other stews. 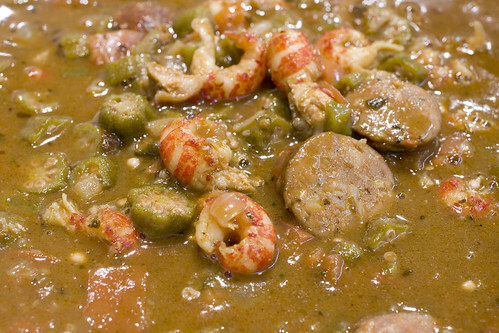 Cajun spice blends, crawfish, andouille sausage, okra, roux, all very gumbo-esque. great post. i’m wondering if foodmayhem will post up videos in the near future as well? it would be great to use video to illustrate tip #5. keep up the good work, guys. Crawfish are much more appealing when they are out of the shell. 🙂 That being said, delish dish! Oh and totally agreed that those okra juices can be just too much if they’re left in the stew too long. We like to add them towards the end, but it your trick is something new to try. Jean Tsao, we would love to post up videos, any one out there want to be my videographer? for food? Hey, not bad. I live in Louisiana, and it bugs me when people throw a little cayenne pepper or red pepper into a bland recipe and call it Cajun. It looks like you did your research before making it. I’ve never met anybody that put diced tomatoes in gumbo before, but it may just be where I live. Diced tomatoes are in etouffee. My family doesn’t like okra in our gumbo. It is traditional, but it tends to make the gumbo slimy. Crawfish get easier to peel with practice. I’ve never peeled ones that had been cooked and frozen, though. Most of my peeling experience is right after a crawfish boil. You’d better peel quick or you’ll go hungry! Anon – Thanks for the local feedback, I really appreciate it! I’ve seen so many different recipes for gumbo, and most I saw include some type of tomato product. But I agree that many don’t. Gumbo is just such a loose term. One of my dreams is to go to a real crawfish boil. I’ve heard about side of the road boils where you pay by the pound and just eat eat eat. I’d be there in a heart beat… if I lived close by. In regards to okra being slimy, I hear ya. Try the vinegar technique I described and let us know if that helps avoid the slime. Oh man this looks so good! I love crawfish! 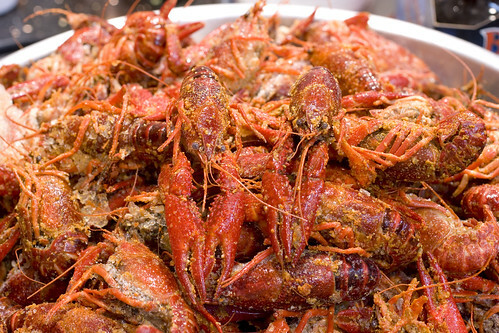 Oh, when it comes to crawfish boils…oh, happy day! I grew up in New Orleans and I remember family crawfish boils. We’d make a long plank table, cover it with layers and layers of newspapers, and when the crawfish were done, they’d just pour them out down the center of the table, call the kids and and pour the ice cold RC Cola (beer for the grownups). And as Anonymous says, peel fast! P.S. The leftover potatoes from the boil (you boil potatoes and corn in with the crawfish) make THE best potato salad you have ever eaten. this recipe was absolutely fantastic! just made it for the first time, it was a big hit. Couldn’t find okra in eastern washington state, and i shredded a chicken breast and threw that in (cooked in advance) with the sausage. amazing recipe, thank you for posting this! Coming from Northeast TX, I grew up around gumbo but this was the first time I had ever cooked it myself. I must say it turned out wonderful!! I excluded the vinegar and just cooked the okra without it plus I used chicken stock instead of crawfish stock. It still turned out delicious! Oh, and I used Amber Bock beer since it was the only bottle in the fridge. Thank you for the wonderfully detailed information and recipe!! I totally have it bookmarked for future reference.